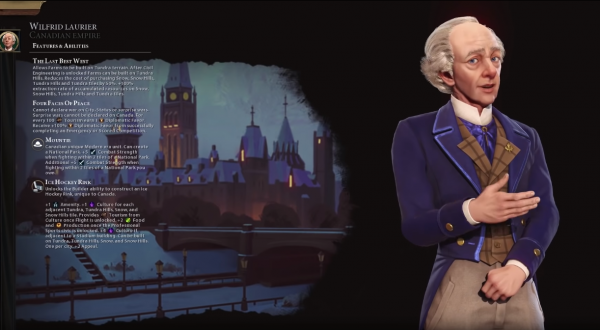 The Gathering Storm DLC releases for Civilization 6 this week which adds new leaders, events and some major changes to the world stage. 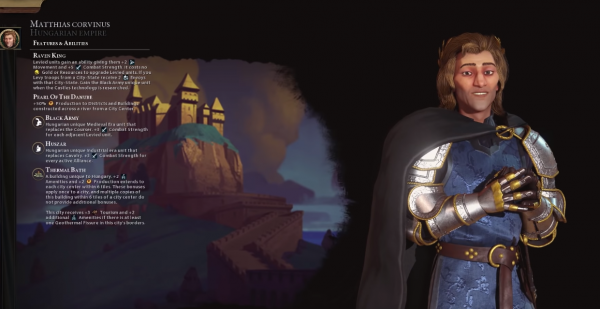 Gathering Storm is set to rock the foundations of Civ 6 by adding natural disasters, new wonders and a new victory method. It also adds the World Congress , climate change scenarios and the Future Era. The addition of the Future Era is to show players how their world and civilizations can be affected by fossil fuels, overpopulation and the invention of new technologies such as carbon recapture and seasteading as the mainland becomes more inhospitable. There are nine new leaders added into the mix with eight new civilizations. Each comes with their own bonuses, special units and Unique Abilities to help you succeed. 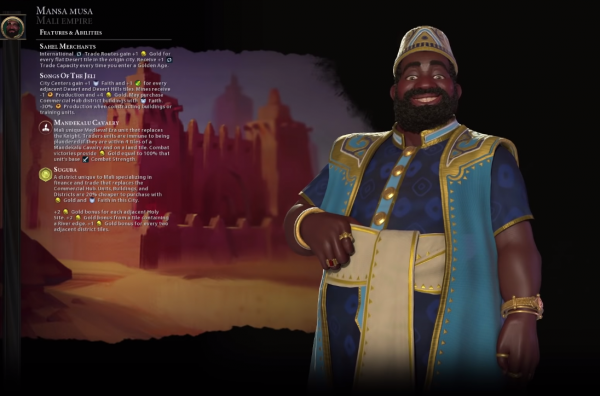 This guide will focus on what each new leader will bring to Civ 6 to help you become the cultural icon or troublesome warlord of your dreams. You can choose to rule France or England with the Duchess, as she ruled over both. Her unique ability is the Court of Love, where Great Works in each of her cities to cause -1 Loyalty per turn on all foreign cities within nine tiles. If a city leaves another Civ due to a Loyalty deficit and is receiving the most Loyalty from Eleanor, it will flip instantly and you won’t need to go through the Free City phase. You’ll also receive the Workshop of the World, where Iron and Coal mines will accumulate one more resource per turn. There’s also +100% Production towards Military Engineers, and they also receive +2 charges. Buildings that provide additional yield when Powered by the likes of coal will receive +2 from that yield. The Sea Dog is the unique unit for this civ, which is a Renaissance-era naval unit that replaces the Privateer. There’s a chance it will capture defeated enemy ships and can only be seen by other Naval Raiders unless adjacent to the Sea Dog. It will reveal other Naval Raiders within sight range. The Royal Navy Dockyard replaces the Harbour district when playing as England, and removes the Movement penalty when embarking or disembarking to and from this tile. It has to be built on a Coast or Lake Terrain adjacent to land. There’s also a +1 Movement buff for all naval units built in the Dockyard. As an added bonus, you’ll get +4 Loyalty and +2 Gold per turn when built on a foreign continent, but cannot be built on a Reef. 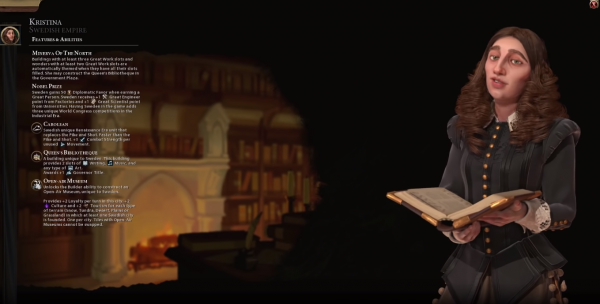 Research trading and start spreading your influence early on with Eleanor, all the while quietly building a massive naval armada to take down any threatened foes. You’ll need to stay busy on the Great Works front and store them close to enemy cities for maximum effect. If you play as France, you’ll get a 20% extra production to Medieval, Renaissance, and Industrial Wonders, and the majority of these have ample Great Work slots. Playing as the French also gets you double tourism from all Wonders and the Chateau improvement, which would almost guarantee a Cultural victory. 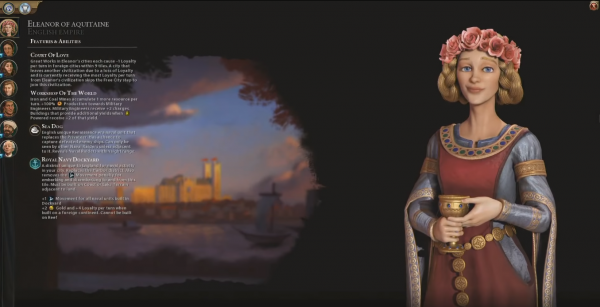 Dido’s Unique Ability is Founder of Carthage, which allows you to move your capital to any city with a Cothon by completing a unique city project. She also gets an extra trade route for the Government Plaza district and each of its buildings and a +50% production towards all districts in the city where the Plaza is located. You’ll also get Mediterranean Colonies, which grants +2 movement and sight range to embarked settlers. This means that all coastal cities on the same continent as your capital will always be 100% loyal, which is very useful at any stage in the game. To mark Phoenicia’s invention of the alphabet, they start with the Eureka moment for Writing, which means you can spend your Research Points elsewhere. The unique unit for this civilization is the Birema, which replaces the Galley. It is much stronger and faster than the Galley, and traders within four tiles of a Bireme cannot be plundered. You’ll also get the Cothon as a unique building. The Cothon replaces the Harbour and can be built on any lake or coastal tile, and gives you +50% production towards all naval units and Settlers. It also allows naval units within the city’s borders to heal completely in a single turn, which is very useful against early seafaring civilizations. 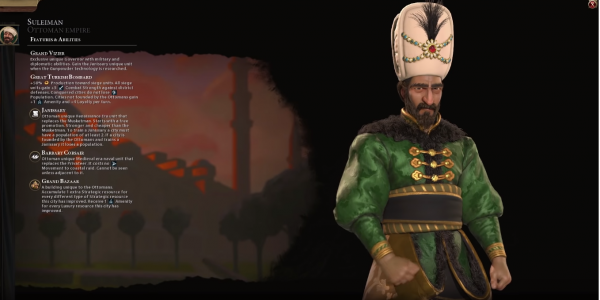 Suleiman and the Ottoman Empire have been added at last to Civ 6. His unique leadership ability is Grand Vizier, which unlocks a Governor called Ibrahim. He has a unique promotion tree and he can be established in another Civilization if you like taking your enemies down from the inside. The Ottoman’s unique ability is the Great Turkish Bombard, which grants +50% production toward all siege units, as well as giving them +5 combat strength against district defences. If you manage to conquer a city, its population won’t plummet and you’ll still get amenity and loyal bonuses while under your control. You’ll also get the Barbary Corsair and the Janissary as your unique units. The Barbary Corsair can be built early on and can perform coastal raids that won’t cost any movement points. It also remains completely invisible unless enemy units are adjacent to it, which again will be very handy against seafaring enemies and when trying to storm a coastal city. The Janissary replaces the Musketman but is stronger, cheaper and you immediately get a free promotion when you purchase one. The downside is, they will consume a population unit in the city they are constructed in unless they are trained in a conquered city. It would be a good idea to recruit them once you have successfully conquered a city and are looking to rebuild your army. Finally, the Grand Bazaar is your unique building for the Ottoman Empire. This replaces the Bank in your Commercial Hub and contributes amenity points, which is handy. It also buffs how much of your city’s key strategic resources you harvest, so it’s important to construct it early on. Kristina’s leadership ability is Minerva of the North, which allows you to construct the Queen’s Bibliotheque in the Government Plaza. On top of that, buildings with at least three Great Work slots and Wonders with at least two Great Work slots are automatically theme when all of their slots are filled. The Nobel Prize is Sweden’s unique ability, where you’ll receive additional Diplomatic Favour when you earn a Great Person. You’ll also get extra Great Engineer points from Factories and extra Great Scientist points from Universities. It also unlocks three unique World Congress competitions in the Industrial Era. Sweden’s unique unit is the Carolean, an anti-cavalry unit that is unlocked when you enter the Renaissance era. It replaces the Pike and Shot, moves much quicker and gains additional Combat Strength for each unused Movement point. You’ll also have access to the Queen’s Bibliotheque. It’s a second tier building that can be constructed in the Government Plaza and provides two Great Works slots for Writing, Music and Art. Once it has been constructed, you’ll be awarded a Governer Tile. Sahel Merchants are Mansa Musa’s leadership ability, with International Trade Routes grant Gold for each flat Desert tile within the originating city’s borders. It also unlocks an additional Trader slot whenever this civilization enters a Golden Age. Songs of the Jeli, Mali’s civilization ability, provides City Centres with additional Faith and Food for every adjacent Desert and Desert Hills tile. Mines provide less Production to the city though they will grant additional Gold output. You’ll also be able to purchase Commercial Hub district buildings with Faith, but there will be a big Production penalty when constructing buildings or training units. If you’re looking for a stalwart Faith win, Mali would be a sound choice due to the extra Faith you can gain and its purchasing powers. The Mandekalu Cavalry is a Medieval era unit that replaces the Knight and prevents Mail Trader units from being plundered if they are on a land tile within four tiles of a Mandekalu Cavalry unit. If you win a battle, you’ll receive Gold equal to the unit’s base Combat Strength. You’ll receive the Suguba unique district, which is a replacement for the Commercial Hub which allows Mali to purchase Units, Buildings and Districts at a reduced cost with either Gold or Faith. It also provides additional Gold for adjacent Holy Sites, tiles that contain a Rover end and bonus Gold for each adjacent District tiles. Again, if you’re going for a trading-based or Faith win, you’d want to construct this as early as possible. There’s also an incentive to go to war to earn gold for every victory, but you’d need to pick your fights well at such a crucial era. 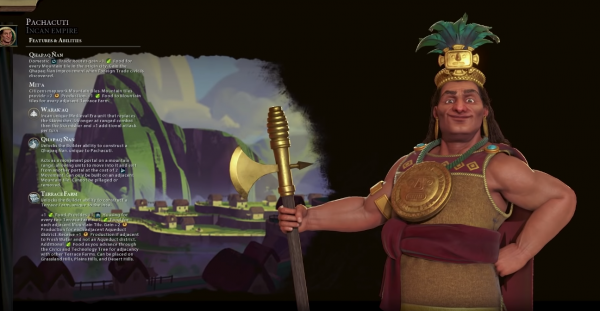 Another Civ 5 favourite, Pachacuti will also be playable with Gathering Storm. His leadership ability is Qhapaq Ñan where domestic trade routes generate +1 food for each mountain in the caravan’s origin city. It doubles as an improvement that builders can place on mountains and lets you teleport between each Qhapaq Ñan improvement through the mountain range, allowing for some very speedy travel. This would be useful to build early on so you can expand your civilization rapidly through teleportation if having a massive country is your MO. If war is more your thing, it means you can transport an army through the mountains much faster, giving you a real tactical advantage. The Incan civilization ability is Mit’a, where citizens can work mountain tiles and you’ll receive +2 Production. The Warak’aq is a Medieval era Recon unit that can attack twice if it hasn’t spent all its Movement points. The Terrace Farm is the unique improvement available with Pachacuti, but it can only be placed on hills. It provides +1 food and +1 food for each adjacent mountain tiles. You’ll also receive +2 Production for adjacent aqueducts, as well as fresh water for the local city. There’s a real focus on working the hills and mountains around you with the Incans, which will give you ample food and water benefits for your sprawling cities, as well as a tactical advantage over mountain terrain. Wilfrid Laurier is Canada’s leader, bringing with him the Last Best West leadership ability. This allows you to build farms in the tundra, and you can build tundra hills after you’ve researched civil engineering. Snow and tundra tiles give double the average amount of consumable resources and can be purchased for much less than normal. Four Faces of Peace is Canada’s unique ability. Canada can’t declare wars on city-states, but also can’t declare or be targetted by surprise wars, which means if you prefer to play a more Pacifist style you won’t be caught totally off-guard. Canada also gains +100% diplomatic favour from completing Emergencies or Competitions in the World Congress. It also gains one diplomatic favour with every 100 tourism. You’ll also get the Mountie unit that can establish National Parks. The Mountie also gets a combat bonus when fighting near National Parks, which increases further if the National Park is owned by Canada. The Ice Hockey Rink is Canada’s unique improvement that can be built in the tundra or on a snow tile. Only one can be built per city and will provide Appeal, amenities and grants extra Culture if there are adjacent snow or tundra tiles. Once you have discovered Flight, it will also provide tourism, as well as Production and food after Professional Sports has been researched. If you build the Ice Hockey Rink adjacent to a Stadium, you’ll receive an extra Culture boost. If you’re looking for a Culture or Tourism win, Canada is the obvious choice. Similarly, if you choose to go to war or to fight back against an invading civilization, you’ll have time to build up a decent sized army while you’re antagonising or being threatened by another civ. Kupe’s leadership ability is Kupe’s Voyage, where you begin the game at sea. You’ll receive bonus science and culture until you settle your first city, then you’ll get a free builder and gain bonus population, housing and amenities. This seems a lot up front, but it’s to ensure you don’t fall too far behind your competitors while you search for the perfect spot to build your civ. 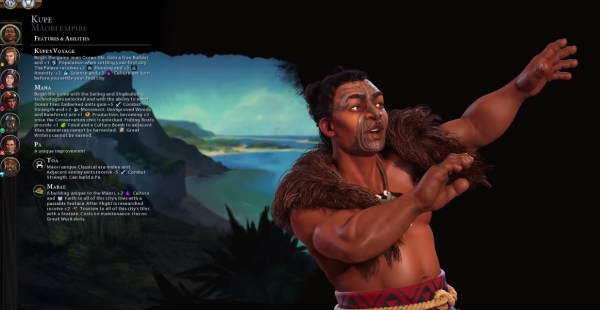 The Maori unique ability is Mana, where you get the Sailing and Shipbuilding tech from the beginning of the game, plus some bonus Movement and Combat Strength for embarked units. You’ll also receive bonus Production if working in woods or rainforests, and you’ll get bonus food from fishing boats. The unique unit for this civ is the Toa, a Classical era Melee unit that can build the Pa, a defensive structure that gives Combat bonuses for allies occupying it. The Toa unit also debuffs adjacent enemies’ Combat Strength, which could make a significant difference in battles against civilizations with more advanced units. The Marae replaces the Amphitheatre, which gives Culture and Faith to nearby tiles with passable features, as well as a big Tourism boost once Flight has been researched. The Maori is pretty versatile in regards to what kind of victory you can achieve. You would be a powerful seafaring enemy, a potentially well-fed and robust population and formidable enemy with the Toa’s debuff ability. The Culture and Tourism bonuses, alongside the opportunity to access more advanced research options quicker than your foes, means you could have a very happy population with regular Golden Ages, depending on your location and success. Hungary has The Raven King leadership ability, which grants you two envoys when levying troops from a city-state. These troops get extra Movement and Combat Strength and can be upgraded at no cost. You’ll also receive a second unique unit, the Black Army. This is a light cavalry than gains bonus strength from adjacent levied troops. You’ll also get access to the Huzsar, which is an Industrial era light cavalry unit that gets a Combat bonus for each active Alliance with another civ. Hungary’s unique ability is the Pearl of the Danube, where districts and buildings are built faster if they are in a city centre that is across a river. The Thermal Baths will replace the Zoo when playing as Hungary, which provides amenities and Production to every city centre in its range, as well as extra amenities and tourism when near a Geothermal Fissure in the city borders.